Kitao, M., Komatsu, M., Yazaki, K., Kitaoka, S. and Tobita, H. 2015. Growth overcompensation against O3 exposure in two Japanese oak species, Quercus mongolica var. crispula and Quercus serrata, grown under elevated CO2. Environmental Pollution 206: 133-141. Working in an experimental field of the nursery of the Forestry and Forest Products Research Institute of Tsukuba, Japan, Kitao et al. (2015) grew seedlings of Japanese oak (Q. mongolica and Konara oak (Q. serrata) for their initial year of life in normal atmospheric conditions, after which they grew them for an additional two years within ambient-air chambers and chambers maintained at 550 ppm CO2 and twice ambient ozone (O3) concentrations. And what did they thereby learn? The five Japanese researchers report that both of the oak species showed significant growth enhancements (twice those of the ambient-treatment trees) under the combination of elevated CO2 and O3 (see figure below), which they attributed to (1) "a predominant enhancement of photosynthesis under elevated CO2" and (2) "a preferable biomass partitioning into leaves induced by O3." 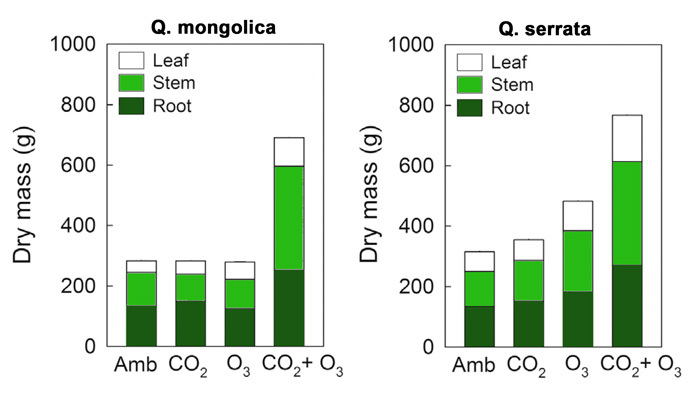 Dry mass of different organs of the seedlings of Q. mongolica (left panel) and Q. serrata (right panel) grown under ambient air (Amb), elevated CO2 (CO2), elevated O3 (O3), and the combination of elevated CO2 and O3 (CO2 + O3). Adapted from Kitao et al. (2015).